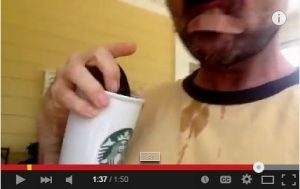 Just posted a quick (probably the quickest video I’ve done) on why a Starbucks Ceramic Mug – SEE it HERE if you’ve ever wondered why some thing’s warn “do NOT microwave.” Guess who got burrrned?? Or maybe you want to tip her off on something new called Amazon Mom? « Ten Burger Tricks and Tips – Lid Up or Down?